Get The Newsletter | The Site Map | The Food Delivery Guide | Best Buffets | What's New? Arena family entertainment center, a project of Millennium Entertainment (Pvt.) Ltd. is not just a run of the mill amusement facility, but one of its kind and pioneer in the field of refined and sophisticated family entertainment and recreation. The environment and the ambiance of Arena is the envy of many catering to the needs and feeding the entertainment appetite of the vast population of Karachi. 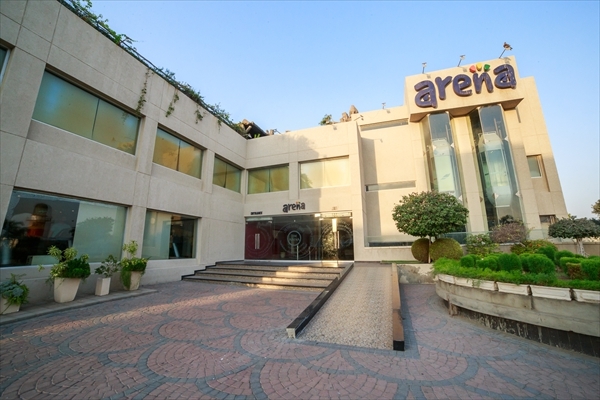 Situated in the heart of the city at main Karsaz, Arena is easily accessible from all parts of the city and supplies a large monitored and secure parking lot for the convenience of its customers. Arena also features the Power House Gymnasium, with a complete range of state-of-the-art imported exercise machines and The Jade Hall, the biggest covered pillar-less hall in Pakistan. In order to deliver fun and entertainment for people of all ages, a combination of nine different recreational activities, food outlets and mocktail/dessert bar have been created within the Arena recreation center, many of them having been introduced for the first time in the country. A zone for latest video games. You are player and you are control. Yes this is sensor based game zone. Let’s play with us! Groom your personality and strengthen and know your skills by playing various games from list provided. Its’ place for all ages no restriction no rules to follow just play and enjoy our updated collection of more than 50 games categorized in sports, action, racing, and adventure. Are your kid adventurous personality? No! Bring your kids at Arena, give your kid a try on exploring the Jungle Jim like zone, which combines entertainment for kids called the Just Kid-ding. The Just Kidding is where children can touch the skies of entertainment by merging themselves in its fun-filled structures like Ride slides, Holding rope and lot more. The Just Kid-ding is simply the Kids heaven. JUST BOUNCE is a word where the wall becomes the floor, a slam-dunk is within you grasped and the rules of gravity no longer apply. Its packed with lots of things to do with kinds and the family, it takes the rush of getting airborne and adds a bunch of new dimensions – from aerial manoeuvres to slam dunking, wall running and dodge ball warfare. The best part is it doesn’t matter if you’re 5 or an action sports junkie in training – you’re never too old or too young to have an awesome time. JUST BOUNCE is a spring – loaded urban playground with a wide range of things to do with kids; where hard surfaces are replaced with circus-grade sponge, giant air bags and springs. The rush of JUST BOUNCE is infectious. Look around and everyone’s buzzing whether they’re running up The Wall. Launching into the Big Bag or loosening up in the Free Jump arena. It can be as easy or as challenging as you like – a training ground for aerial sports acrobatics, a place to kick back and look out over the action, or just a hard-core form of exercise that lets you burn energy without noticing you’re in the middle of a cardio workout and our friendly staff are al-ways there to offer safety tips and show you a few moves along the way. Fun & adventure for children & adults! Are you bored with the inactive participation, and searching for something active? If your answer is yes! Right here, come with us! Power Jumping up to 7 meters into air off the trampoline. You can look down on the crowd over coconut tree up. Using multiple bungee ropes challenging gravity to jump back in the air with none of the risks. Now grab the fun of Bungee Jumping in the most enjoyable atmosphere at Arena. Looks like you are ready to party, just have blast because there is no age limit for people to celebrate their moments, Arena brings you an opportunity to customize your party according to your wish, Just plan your menu and games you like to be entertained and we make it best for you by adding a joyful sprint into your events. Entrance Fee: Rs. 750 (Adults), Rs. 550/- (Kids) (According to Scale) which can be used toward any attraction or restaurant at Arena. Specials: Get a free game coupon for every buffet purchased at Rangoli. Coupons are valid for 15 days and can be used on any day. Private Parties: Arena will cater to your specific party needs. Smoking Areas: Designated smoking areas available. What to Expect: An impressive architectural structure housing a variety of international standard games and attractions such as ice skating, miniature golf, paintball, rock climbing, bowling alleys and much more. Plus friendly customer service and hygienic restaurants. Rangoli is an artistically designed traditional theme buffet restaurant with a total seating area of up to 550 people. Separate seating areas include a main dining room, an outdoor seating area and a casual low seating area. Rangoli's abundant buffet area offers many Pakistani dishes such as Paya, and international dishes such as fried prawns and Chinese. The open-air "bazaar area" offers specialties such as sajji chicken, batair, a shawarma station, Ouzi - a whole roasted lamb carving station and a made-to-order pasta station. All types of fresh salads are offered, as well as a dessert area featuring chocolate mouse and blueberry cheesecake. The beautiful and modern décor of Café Mist shows that no detail has been overlooked at this fresh and comfortable eatery. From sandwiches and burgers to steaks and pizzas, and even a specially designed kids menu, Café Mist is is the perfect place to replenish yourself during a day of fun and games or just relax and enjoy the food, atmosphere and friendly service. Arena has the privilege to introduce Pakistan's first ice skating rink. The Ice Deck is 3,500 square feet of pure skating heaven. Show off your moves or finally learn how to master the ice with our skilled coach. Beginner or expert, there's place for everyone. Mini golf and major fun! The course is designed in such a way that it works for beginner putters and children as well. Specially placed lighting allows players to indulge their golf craze at night too. Those who always only dream to hold the golf stick ONE SHOT is one to make their dreams come true. Boredom driving you up the wall? Drop by our climbing area and add some adventure to your life. Arena gives an opportunity to the people of Karachi to explore their abilities to be mountain climbers in a safe and controlled environment at the venue called Cliff Hanger. Performed on artificial structures that attempt to replicate the experience of real rock climbing but in a more controlled environment. With varying degrees of elevation, steepness and height, rock climbing is a hit with those with an adventurous streak. The Cliff Hanger is fitted with safety equipment and harnesses so you can climb to the top of the world. Overlooking the entire bowling area is an open loft which features five international quality pool tables. It's an open smoking-area too. So bring your friends to come and hang out, shoot some pool and have a cold mocktail. An exquisite hall with a beautiful ambiance catering to all cooperate and other events with the maximum capacity of up to 250 persons along with a lavish buffet setup. The spacious, elegant and air-conditioned Jade Hall is the biggest covered pillar-less hall in Pakistan. The Jade Hall caters to all kinds of functions, especially targeting the corporate sector for their events, meetings, seminars, training, product launches, conferences and more. A complete range of "State of the Art" imported machines, never ever experienced before in Pakistan. A healthy body leads to healthy performance in every walk of life and Arena's Powerhouse Gym is sure help you meet your heath goals. Please call 021-99245251-4 for pricing and details. None offered currently. Please check back soon. BEEN HERE? TELL US HOW YOU LIKED IT.